Christianity is a monotheistic religion which developed out of Second Temple Judaism in the 1st century CE. It is founded on the life, teachings, death, and resurrection of Jesus Christ, and those who follow it are called Christians. Islam is a monotheistic religion that developed in the 7th century CE. Islam, which literally means "surrender" or "submission", was founded on the teachings of Muhammad as an expression of surrender to the will of God. Those who follow it are called Muslims. Muslims have a range of views on Christianity, from viewing Christians to be fellow possessors of monotheistic scriptures to regarding them as heretics. Christian views on Islam are diverse and range from considering Islam a fellow Abrahamic religion worshipping the same God, to believing Islam to be heresy or an unrelated cult. The Christian Bible is made up of the Old Testament and the New Testament. The Old Testament dates to centuries before the time of Christ. The New Testament dates from the time of Christ, or centuries thereafter. The central books of the Bible for Christians are the Gospels. Christians consider the Quran a non-divine false, later work. The Quran dates from the early 7th century, or decades thereafter. The Quran assumes familiarity with major narratives recounted in the Jewish and Christian scriptures. It summarizes some, dwells at length on others and differs in others. Muslims believe that Jesus was given the Injil (Greek evangel, or Gospel) from the Abrahamic God and that parts of these teachings were eventually lost or distorted (tahrif) to produce what is now the Hebrew Bible and the Christian New Testament. Muslims believe that the Quran present today is the same (unchanged/unedited) as the one just at the time of death of their prophet. Christianity and Islam differ in their fundamental views in regard to the God they worship, the nature of their religion, their beliefs about the crucifixion and resurrection of Jesus. Christians believe that Jesus is the Son of God. Most Christians are Trinitarian, and believe that Jesus is divine and the only flesh embodiment of the being of the One True God. Christianity teaches that Jesus was condemned to death by the Sanhedrin and the Roman prefect Pontius Pilate, crucified and resurrected, as per the Gospel narratives. Christians believe Jesus was divine and sinless. Islam teaches that Jesus was one of the most important prophets of God. Muslims do not believe that he was the Son of God, nor that he is divine or part of a triune God. In Islam, Jesus was a human prophet who, like all the other prophets, tried to bring the children of Israel to the worship of One God. Muslims believe the creation of Jesus was similar to the creation of Adam (Adem). Muslims believe that Jesus was condemned to crucifixion and then miraculously saved from execution. Muslims and Christians both believe that Jesus was born to Maryām/Mary, a virgin. Muslims contend that Jesus argued against the division of God's oneness. Christians do not see the Trinity as implying any division and that Christianity follows God's command to have no other gods from the Old Testament. Christians argue that the New Testament, particularly the Gospel of John, contains or is centered on the Trinity and that Jesus made several implicit and explicit claims to be the Son of God, and divine in nature. John 10:22-42. Muslims believe that the Quran was verbally revealed by God to Muhammad through the angel Gabriel (Jibril), gradually over a period of approximately 23 years, beginning on 22 December 609, when Muhammad was 40, and concluding in 632, the year of his death. Muslims regard the Quran as the most important miracle of Muhammad, a proof of his prophethood, and the culmination of a series of divine messages that started with the messages revealed to Adam and ended with Muhammad. They consider the Quran to be the only revealed book that has been protected by God from distortion or corruption. Muslims revere Muhammad as the embodiment of the perfect believer and take his actions and sayings as a model of ideal conduct. Unlike Jesus, who Christians believe was God's son, Muhammad was a mortal, albeit with extraordinary qualities. Today many Muslims believe that it is wrong to represent Muhammad, but this was not always the case. At various times and places pious Muslims represented Muhammad although they never worshiped these images. The first recorded comment of a Christian reaction to Muhammad can be dated to only a few years after Muhammad's death. As stories of the Arab prophet spread to Christian Syria, an old man who was asked about the "prophet who has appeared with the Saracens" responded: "He is false, for the prophets do not come armed with a sword." The doctrine of the Trinity states that God is a single being who exists, simultaneously and eternally, as a communion of three distinct persons, the Father, the Son and the Holy Spirit. In Islam such plurality in God is a denial of monotheism, and thus a sin of shirk, which is considered to be a major 'al-Kaba'ir' sin. Christians and Muslims have differing views on the Holy Spirit. Christians believe that the Holy Spirit is God, and the Paraclete referred to in the Gospel of John, who was manifested on the day of Pentecost. In Islam the Holy Spirit is generally believed to be the angel Gabriel, and the reference to the Paraclete is a prophecy of the coming of Muhammad. Nevertheless I tell you the truth: It is expedient for you that I go away; for if I go not away, the Comforter will not come unto you; but if I go, I will send him unto you. And thou wilt find the nearest of them in affection to those who believe (to be) those who say: Lo! We are Christians. That is because there are among them priests and monks, and because they are not proud. When they listen to that which hath been revealed unto the messengers, thou seest their eyes overflow with tears because of their recognition of the Truth. They say: Our Lord, we believe. Inscribe us as among the witnesses. How should we not believe in Allah and that which hath come unto us of the Truth. And (how should we not) hope that our Lord will bring us in along with righteous folk? Allah hath rewarded them for that their saying – Gardens underneath which rivers flow, wherein they will abide for ever. That is the reward of the good. In 746 John of Damascus (sometimes St. John of Damascus) wrote the Fount of Knowledge part two of which is entitled Heresies in Epitome: How They Began and Whence They Drew Their Origin. In this work St. John makes extensive reference to the Quran and, in St. Johns's opinion, its failure to live up to even the most basic scrutiny. The work is not exclusively concerned with the Ismaelites (a name for the Muslims as they claimed to have descended from Ismael) but all heresy. The Fount of Knowledge references several suras directly often with apparent incredulity. From that time to the present a false prophet named Mohammed has appeared in their midst. This man, after having chanced upon the Old and New Testaments and likewise, it seems, having conversed with an Arian monk, devised his own heresy. Then, having insinuated himself into the good graces of the people by a show of seeming piety, he gave out that a certain book had been sent down to him from heaven. He had set down some ridiculous compositions in this book of his and he gave it to them as an object of veneration. ... There are many other extraordinary and quite ridiculous things in this book which he boasts was sent down to him from God. But when we ask: ‘And who is there to testify that God gave him the book? And which of the prophets foretold that such a prophet would rise up?’ – they are at a loss. And we remark that Moses received the Law on Mount Sinai, with God appearing in the sight of all the people in cloud, and fire, and darkness, and storm. And we say that all the Prophets from Moses on down foretold the coming of Christ and how Christ God (and incarnate Son of God) was to come and to be crucified and die and rise again, and how He was to be the judge of the living and dead. Then, when we say: ‘How is it that this prophet of yours did not come in the same way, with others bearing witness to him? And how is it that God did not in your presence present this man with the book to which you refer, even as He gave the Law to Moses, with the people looking on and the mountain smoking, so that you, too, might have certainty?’ – they answer that God does as He pleases. ‘This,’ we say, ‘We know, but we are asking how the book came down to your prophet.’ Then they reply that the book came down to him while he was asleep. At the beginning of his advent the misguided Jews thought he was the Messiah. ... But when they saw him eating camel meat, they realized that he was not the one they thought him to be, ... those wretched men taught him illicit things directed against us, Christians, and remained with him. In short, Muhammad was an ignorant charlatan who succeeded by imposture in seducing the ignorant barbarian Arabs into accepting a gross, blaspheming, idolatrous, demoniac religion, which is full of futile errors, intellectual enormities, doctrinal errors and moral aberrations. Goddard further notes that in Nicetas we can see in his work a knowledge of the whole Koran including an extensive knowledge of suras 2-18. Nicetas account from behind the Byzantine frontier apparently set a strong precedent for later writing both in tone and points of argument. 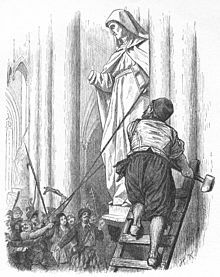 Islam and Protestantism share orientations towards iconoclasm: the Beeldenstorm (statue's assault) during the Dutch reformation. Protestantism and Islam entered into contact during the 16th century, at a time when Protestant movements in northern Europe coincided with the expansion of the Ottoman Empire in southern Europe. As both were in conflict with the Catholic Holy Roman Empire, numerous exchanges occurred, exploring religious similarities and the possibility of trade and military alliances. Relations became more conflictual in the early modern and modern periods, although recent attempts have been made at rapprochement. Mormonism and Islam have been compared to one another ever since the earliest origins of the former in the nineteenth century, often by detractors of one religion or the other—or both. For instance, Joseph Smith, the founding prophet of Mormonism, was referred to as "the modern Mahomet" by the New York Herald, shortly after his murder in June 1844. This epithet repeated a comparison that had been made from Smith's earliest career, one that was not intended at the time to be complimentary. Comparison of the Mormon and Muslim prophets still occurs today, sometimes for derogatory or polemical reasons but also for more scholarly and neutral purposes. While Mormonism and Islam certainly have many similarities, there are also significant, fundamental differences between the two religions. Mormon–Muslim relations have historically been cordial; recent years have seen increasing dialogue between adherents of the two faiths, and cooperation in charitable endeavors, especially in the Middle and Far East. ^ Nigosian, S.A (2004). Islam : its history, teaching and practices ([New ed.]. ed.). Indiana Univ. Press. pp. 65–80. ISBN 0-253-21627-3. ^ Nasr, Seyyed Hossein (2007). "Qurʾān". Encyclopædia Britannica Online. Retrieved 24 September 2013. ^ Peters, F.E. (2003). The Words and Will of God. Princeton University Press. pp. 12–13. ISBN 0-691-11461-7. ^ Glassé, Cyril; Smith, Huston (2003-01-01). The New Encyclopedia of Islam. Rowman Altamira. p. 429. ISBN 9780759101906. ^ "The Major Sins: Al-Kaba'r". Jannah.org. ^ Casurella, Anthony (1 January 1983). "Beiträge zur Geschichte der biblischen Exegese". Mohr – via Google Books. ^ "Who is the "Holy Spirit"? - islamqa.info". ^ "The Smalcald Articles," in Concordia: The Lutheran Confessions. Saint Louis: Concordia Publishing House, 2005, 289, Part two, Article 1. ^ "St. John of Damascus: Critique of Islam". ^ The Chronicle of Theophanes Confessor (Byzantine and Near Eastern History AD 284-813). Translated with introduction and commentary by Cyril Mango and Geoffrey Greatrex, Oxford 1997. An updated version of the roger-pearse.com citation. ^ Goddard, Hugh (1 January 2000). "A History of Christian-Muslim Relations". Edinburgh University Press – via Google Books. ^ "Muslim-Christian Dialogue - Oxford Islamic Studies Online". ^ Thomas Marsh and Orson Hyde Affidavit, for example; see also PBS's American Prophet: Prologue and Todd J. Harris, A Comparison of Muhammad and Joseph Smith in the Prophetic Pattern Archived 2011-11-14 at the Wayback Machine, a thesis submitted for a Master of Arts degree at Brigham Young University in 2007, footnotes on pages 1 and 2. ^ PBS's American Prophet: Prologue. ^ Thomas Marsh and Orson Hyde Affidavit, also Todd J. Harris, A Comparison of Muhammad and Joseph Smith in the Prophetic Pattern Archived 2011-11-14 at the Wayback Machine, a thesis submitted for a Master of Arts degree at Brigham Young University in 2007, footnotes on pages 1 and 2. ^ See, for example:Joseph Smith and Muhammad: The Similarities, and Eric Johnson,Joseph Smith and Muhammad, a book published by the "Mormonism Research Ministry" and offered for sale by the anti-Mormon "Utah Lighthouse Ministries". ^ See, for instance, Todd J. Harris, A Comparison of Muhammad and Joseph Smith in the Prophetic Pattern Archived 2011-11-14 at the Wayback Machine, a thesis submitted for a Master of Arts degree at Brigham Young University in 2007. ^ Haldane, David (2 April 2008). "U.S. Muslims share friendship, similar values with Mormons" – via LA Times. ^ World Muslim Congress: Mormons and Muslims; Mormon-Muslim Interfaith Ramadan Dinner. ^ Moffett, Marian; Fazio, Michael W.; Wodehouse, Lawrence (1 January 2004). "A World History of Architecture". McGraw-Hill – via Google Books. ^ Swartley, Keith E. (1 January 2005). "Encountering the World of Islam". Biblica – via Google Books. Frithjof Schuon, Christianity/Islam: Essays on Esoteric Ecumenicism, in series, The Library of Traditional Wisdom, Bloomington, Ind. : World Wisdom Books, cop. 1985. vii, 270 p. N.B. : Trans. from French. ISBN 0-941532-05-4; the ISBN on the verso of the t.p. surely is erroneous. Mark D. Siljander and John David Mann, A Deadly Misunderstanding: a Congressman's Quest to Bridge the Muslim-Christian Divide, New York: Harper One, 2008. ISBN 978-0-06-143828-8. Robert Spencer, Not Peace But a Sword: The Great Chasm Between Christianity and Islam. Catholic Answers. March 25, 2013. ISBN 978-1938983283.